Preferred Health is the largest Preferred Provider Organisation (PPO) of its kind in the United Kingdom with nation-wide networks of healthcare providers. 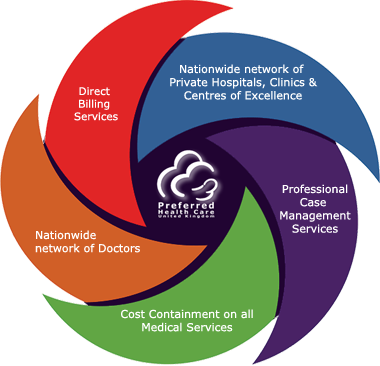 It also provides a range of healthcare management services under the Healthcare Management umbrella. With its unique system of partnerships with healthcare payers and healthcare providers, Preferred Health addresses one the most fundamental issues facing the healthcare industry globally – quality, cost and access to healthcare. Preferred Health - A truly 21st century company making it a win-win-win for the healthcare payers, healthcare providers and the healthcare consumers alike. With clientele both local and international from across the globe, Preferred Health provides a myriad of services – key amongst it being access to some of the best healthcare services globally and direct billing services for our clients and their membership. Our clients profile includes a myriad of Healthcare Payer organisations – kindly check the Our Services tab for more details. Corporate headquarters are in the outskirts of London, England.